Okay. Before I begin this post, let me preface it by telling you what sparked it (although in all fairness I’m been mulling it over for a few weeks). I tried to organize a D&D Game Day for the upcoming date for DMG2 and I couldn’t make heads or tails out of the websites for the RPGA, DCI, or any of that stuff (I’m still not sure what DCI is in regards to RPGA). But this post isn’t really about website bashing, or any bashing actually. It’s more a post on looking at the future of the hobby and how the industry needs to not only embrace the DM, but encourage and makes things easy for him to do his job, because without DM’s, players will run to their avatars on MMORPG’s and get off the tabletop. I usually will try to shy away from posts like this because complaining is not really my thing… And again, I’m not attacking anyone here… There’s a message in this post somewhere, but it will be a little convoluted, bear with me. I’ve been reading some doom and gloom articles recently about the RPG industry. Guys with big names that readers seem to recognize giving expert opinions on the future of the hobby, opinions on print runs and profit margins, and thoughts on what the industry needs to do to survive because the end day is upon us… That’s fantastic if you’re into that stuff. I’m not. I’m more practical. The industry, my friend, needs you. The DM. You see, the DM is a man of many hats. You run games, you organize them. You may get your group together via emails, or phone calls. You are the glue that holds the 7 guys around the table together. Without you, those guys wouldn’t be there on Friday night rolling dice. Maybe they’d be on a play by post board or something, maybe playing WOW, but neither of those is true tabletopping. The DM is the single most important member of a particular group, because without a DM that group has no reason to be sitting there holding their character sheets. So then the industry in order to survive, needs to appreciate the DM more. Make our job easier. Make it fun. Make it interesting. Make us feel special. Make us want to do this. WOTC seems to be doing a good job of this with the DM rewards I’ve read about. That’s wonderful, unfortunately for me, navigating that site lead me nowhere if not my WordPress login to write this post. There needs to be an emphasis on the RPG industry as a whole to single out DM’s for what we do. We teach the game to new players! We bring in customers to their fold who’ll hopefully get as much out of the game as we do! We are their most important customer. So the future isn’t in whether or not a PDF with black or white line art can sell for as much as a full color art PDF and maintain the profit margin… ughh.. it’s boring just to type that… The future lies in us, we keep these games running. The industry needs to try to keep us running. Make it fun. Make it easy. Make it rewarding. We’ll try to take care of the rest. For the most part I agree with you, but how can they make a DM “feel special?” Yes, technically I am (was (Took the stupid test under 3.5)) an RPGA DM, though I have never actually played a RPGA game. So rewarding me through the RPGA is probably not going to work for me. The way I became a DM is because the DM of my old gaming group was no longer around and us the players still wanted to play. No one wanted to do it, so eventually I stepped up. I ended up loving it. 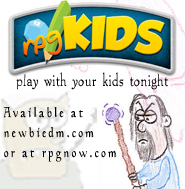 And as far as having no players, it’s now your job as a dm to find new players to introduce and teach the game to. This is what I mean about the survival of the hobby. The DCI is for WotC card games, the RPGA is for WotC RPGs. It isn’t that tricky, I’ve been a DCI judge for years, and their site isn’t that confusing, I don’t think. As someone new to D&D, 4E AND DMing, it’s interesting to see these posts from the ‘industry people’. I bought myself a DMG, a MM and a PHB 1&2 and inside those was everything I needed to design and write my own campaign. It started off as a simple 4 encounter adventure to see if my friends and I liked it and grew into a huge world spanning story. I did get a little bit of help from reading some of the free adventures that WOTC have available and still get a lot of help from the community blogs like this one (thanks newbieDM!) but for the most part, I’m happily working it out for myself. For me, the thing I’d REALLY like to see would be ‘theme packs’ for minis – running a series with lots of goblins and their kin? grab this handy pack with a range of appropriate minis, and ooh, we’ll throw in this funky poster map of a cool Goblin lair. I think that part of the ‘doomsayer’ issue is that design tools are much easier to get hold of, and contrary to popular wisdom, a whole generation brought up on TV and video games are actually much more imaginative. We ‘get’ how stories fit together as scenes so we write our own stuff instead of buying it. What a delightful sentiment. I had never really thought of this before. Embracing the GM is definitely right and can only help. As the poor chap who normally GMs in my group, I would like to feel like a publisher cared a bit more about me. After all, the players are working as a team to battle the foes and you are working with the publisher to do your bit to provide the fun. Great post! Weird, considering I posted a little bit along these lines today as well! Must’ve both been feeling it! The DM is a special role–it’s one that requires more work, more involvement, and responsibility that a lot of players don’t want or can’t handle. That’s not to say it’s some Ultra-Elite Task Force, but it is a unique role in the gaming group. I agree, that without a DM the game is not going anywhere, and I do think that helping DM’s to find and organize players is a good thing. When I first heard about some of the things DM’s could get for running games through the RPGA I thought I would go sign up. Problem was I could’nt find a place to do that. Finally I realized that you have to go to an RPGA game to join from an existing DM (pain). So I tried to bring up the calendar of events, but I kept getting a page not available. I tried calling my FLGS and he does not have anyone running an RPGA event (sounds like he needs someone interested in becoming an RPGA DM). I think WOTC has made the RPGA to difficult for a darn near 40 yr old guy to get involved with. Too much work to track down a game somewhere just to get a membership. D&D has always been a prep-intensive game that leaves most of the “heavy lifting” for the DM. However, there are plenty of other RPGs these days that require little to no preparation, spread the creative responsibilities out to the rest of the group, or don’t use a GM at all. If you’re finding you no longer have the time to organize and run a traditional RPG, give some small press games a try. I tried getting into the RPGA site a while back for the same thing. Except that apparently the RPGA number that I have doesn’t work to get me into the site. With no way to sign up for a new number, I’m locked out pretty much unless I go to a convention. There aren’t other RPGA DMs in my area as I live in rural Wyoming. I agree with your argument. You should, however, keep in mind that there are a fair number of women game masters (and gamers in general) out there, so perhaps using gender neutral language would be a good habit to get into? @Del: YOu speak due to familiarity with the system, but look at it from an outsider looking in, plus other responsers from readers on this posting and you’ll see what I mean. @Mike: someone reminded me that in the DnD 2e. book preface, the authors tell you in the preface that they will use the “he” pronoun throughout. IIRC they argue that the pronoun has been neutered enough to be used as a generic one. Apply that to my site from now on when you read my articles, and thanks for the comment. I strive for feminism myself, so I’ll just say that there have been significant advances in gendered usage of English since the release of the 2e player’s guide. WoTC, to their credit, acknowledged this during the 3e era. White Wolf, I believe, does the same. I do my best to follow their example, but it’s hard. But yeah, the argument that “he” has been neutered hasn’t held a lot of weight in around two decades. @Neal: I get it… at the end of the day it’s just easy for me to write the way I do… plus, I suspect the bulk of my visitors are men anyway. Guys, I think most women understand that what’s being said applies to them equally and without prejudice. My gut feeling is that they get it and give you the benefit of the doubt. Yes dwarves and elves again please!!!! I deal with enough political correctness/gender neutrality in real life!!!! Wait can I call them dwarves?